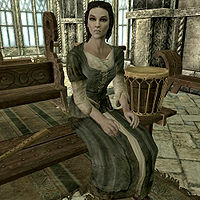 Illdi is a Nord bard studying at the Bards College. Although she respects her teacher, Inge Six Fingers, and refers to the College as a musical museum, she is very insecure and claims that she is not very well liked by anyone. Illdi wears a set of farm clothes along with a pair of boots. She wields an iron dagger and carries her key to the College along with a selection of common loot and gold. Despite her belief that she is not liked by anyone at the College, Illdi will greet you warmly: "You're new here, right? Welcome to the Bards College. It's like a... musical museum." She will be quick to tell you about her suspicion of not being liked by anyone: "You know, I don't get the impression that I'm very well liked at the College..." After completing Tending the Flames, she will be happy to see that you arrived safely back at the College: "I'm so glad you got back from Olaf's Tomb okay. They gave you a tougher task then they gave me." Illdi's individual topic dialog is missing, as it requires she be in the courtyard outside the College at 11am. This conflicts with her scheduled noon market visit. This issue has been addressed by version 1.2.5 of the Unofficial Skyrim Patch; now visits the market in the 6pm evening slot previously used by Aia Arria. Illdi's sleep package conflicts with much of her morning schedule and leaves her wandering late at night alone in the courtyard outside the College. Considerable dialogue was written for Addvar and his various customers. Unfortunately, they were recorded in Jala's voice. Illdi's dialog is mixed with Jala's other dialogue. See Addvar Bugs for this dialog.